There is a crying need in the church today for men to be men. But competing visions for what a man is to be —some growing out of popular culture and others arising from flawed teaching in the church—are exacerbating the problem. In his newest release from Reformation Trust, Rev. 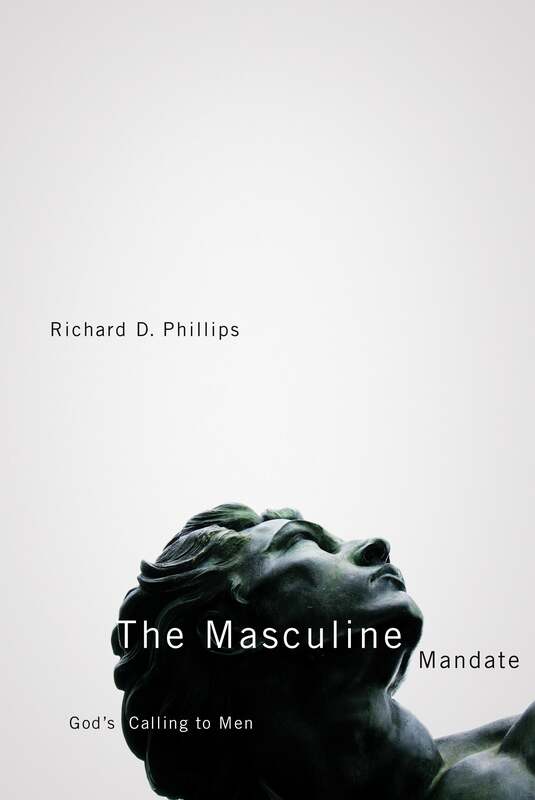 Richard D. Phillips believes the problem and the inadequate solutions being put forward demand sound exegesis of biblical passages relating to masculinity. The Bible alone has the answer to what men are to be in the eyes of their Creator. —Iain M. Duguid, Professor of religion, Grove City College, Grove City, Pa. Preface - It is remarkable to me how easily precious things can be lost. An individual can quickly lose precious possessions such as innocence, integrity, or a good reputation. The church can lose precious things, too, and this seems to be happening today. One ideal we may be losing is that of strong, biblical, and confident Christian manhood. Not long ago, we were all told to get in touch with our “feminine side” (as I’ll note again later, mine is named Sharon), and this sort of cultural foolishness has resulted in many men misperceiving what it means to be a godly man, a loving husband, a good father, and a faithful friend. This book is written for Christian men who not only don’t want to lose that precious biblical understanding, but who want to live out the calling to true manliness God has given us. We need to be godly men, and the Bible presents a Masculine Mandate for us to follow and fulfill. But do we know what it is? My aim in writing this book is to help men to know and fulfill the Lord’s calling as it is presented so clearly to us in God’s Word. Page 4 - When it comes to practically every question about God’s intentions for men and women, the answer is almost always the same: go back to the garden. When Jesus was asked about marriage (Matt. 19:4–6), He answered from Genesis 2. Likewise, when Paul was discussing the role of women in relation to men (1 Tim. 2:11–14), he found his answers in Genesis 2. The New Testament sees issues of gender and male-female relationships answered in the opening chapters of the Bible: the basic teaching on creation in Genesis 1 and the record of God’s specific dealing with the first man and woman in Genesis 2. It is here that we should search for the Bible’s most basic teaching on manhood. Page 13 - Take a Christian man’s professional life, for example. I’m going to address this in more detail in the next chapter, but for now let’s observe that our calling to work means investing ourselves in accomplishing things of value. Men should be using their gifts, talents, and experiences to succeed in worthwhile causes that (if they are married) provide for their families. This can be anything that accomplishes good. A man can make eyeglasses, do scientific research, or manage a store; the examples are almost endless. But in each case, our mandate to work means we should be devoting ourselves to building good things and accomplishing worthwhile results. There is nothing wrong with a man working simply to earn a wage, but Christians rightly want their labors to yield more than money for themselves and their families. Christian men should also desire to cultivate something worthwhile for the glory of God and the well-being of their fellow men. Page 45 - Whatever we call it, it seems obvious that America is facing a leadership crisis. Bold leadership and the exercise of authority are commonly met with skepticism, if not outright disdain. I believe this is happening for two reasons. First, in our sinful pride we all have a resistance to being led, especially in a country like America, where independence is highly prized. Second, we are all familiar with leaders who have used their power to enrich their own lives, abusing rather than blessing those entrusted to their care. Some business leaders have been shown to be self-serving scoundrels, so we tend to see all of them in that light. Political leaders are widely perceived, rightly or wrongly, as having been bought by moneyed interests. Because so many men fail to conduct themselves in an honorable, biblical way, women can become skeptical of the entire male gender. Certainly, few of our cultural heroes today are leaders in the biblical sense—those who serve and influence their followers, steering them toward some greater good. Pages 55-56 - This divine mandate for men applies to all our roles and relationships, including being fathers to our children, friends to other men, and servants in the church. But more primary than any of these is the Masculine Mandate as it applies to the covenant of marriage, which God has made basic to all human society and which most closely resembles our relationship with Him. When it comes to marriage, knowing definitely makes all the difference. What do men need to know about marriage? If my experience as a pastor and counselor is any guide—experience corroborated by nearly every pastor with whom I have discussed this topic—the best answer is something like this: “Quite a bit more than they know now.” For there is unquestionably a general ignorance among Christians, most significantly among Christian men, about the Bible’s teaching on marriage. Pages 60-61 - In God’s fashioning of woman as a suitable helper for man, we find both the wonder of marriage and the challenge of marriage. By God’s design, a woman is made for essential oneness with man. Thus, Adam cheered, “This at last is bone of my bones and flesh of my flesh; she shall be called Woman, because she was taken out of Man” (Gen. 2:23). Women are men’s equals, not men’s possessions or slaves. Yet they are different. So men find women compellingly attractive, yet mysterious. Page 94 - As I hope is clear by now, the main premise of this book is that the mandate of Genesis 2:15 summarizes our calling as men in our various roles. God put Adam in the garden “to work it and keep it,” and the only difference between Adam’s calling and ours lies in the details of how we seek to fulfill it. So far, I have laid the doctrinal groundwork for this position and developed the theme within marriage, where a woman is to be built up and kept safe by her husband. But does this mandate apply to a man’s calling as father? It absolutely does. Page 122 - In our study of manhood and the Bible’s Masculine Mandate to work and keep, it is obvious why we focused first on marriage and fatherhood. These are the personal relationships that dominate a man’s life. But they are not the only relationships a man is to enjoy. One mark of a true godly man is his faithfulness in friendship to other men, especially to Christian brothers. The Bible celebrates the true friend, and most of us find that godly male companions are among the most blessed resources in life. Pages 131-132 - In demonstrating the use of the Masculine Mandate among God’s people collectively, Nehemiah set a precedent that holds even today. Within the church, men are called to work and keep in service to God. That is, Christian men are to labor in the church with the trowel in one hand (Adam’s gardening trowel and Nehemiah’s brick mason’s trowel supplemented by the “trowels” of a thousand other professions and pursuits) and with the sword of truth (which never really changes) in the other hand. Under such servant-laborers and the guardian care of godly men, Christ’s church grows strong and remains safe for its mission of spreading the gospel in the world. Richard D. Phillips (M.Div., Westminster Theological Seminary) is senior minister of the historic Second Presbyterian Church in Greenville, S.C., a member of the council of the Alliance of Confessing Evangelicals, and chairman of the Philadelphia Conference on Reformed Theology, which was founded by James Montgomery Boice. He is the author of numerous books, including Jesus the Evangelist, What’s So Great about the Doctrines of Grace?, and Hebrews in the Reformed Expository Commentary series. His preaching is heard weekly on the radio program God’s Living Word. Prior to his calling to the gospel ministry, Rev. Phillips served as a tank officer in the U.S. Army and was assistant professor of leadership at the United States Military Academy, West Point, resigning with the rank of major. He lives with his wife, Sharon, and their five children in the Upcountry of South Carolina. View other books and articles by Richard D. Phillips.